Phnom Penh, Apr 20 2017 - Tensions in Cambodia are growing. The reigning party have been in power for decades, but as the upcoming elections in June come closer, support is gathering for the opposition. The response from the government has been to pass laws that seek to silence protests. The corridor is stacked with boxed kits of demonstrator equipment. In each box there are sections for vests, for helmets and for glasses. ”For teargas”, Naly Pilarge explains. She works for the Cambodian human rights organisation Licadho. Political control in the country has tightened. In June local elections will be held, followed by parliamentary elections in 2018. The government has started to sense that its hold on power is threatened. For defenders of civil rights, Cambodia has practically turned into a one party state. Every Monday, members of the opposition dress in black to show their discontent with the present regime. This led to the arrest of two women a few weeks ago. The commander of the army commented: ”We can’t permit a revolution of color in the country”. The government has started to sense that its hold on power is threatened. For defenders of civil rights, Cambodia has practically turned into a one party state. A year ago, on the tenth of July, local politician Kem Ley was followed into a gas station in the capital city Phnom Penh by a man with a gun. Three shots to the head ended his life. The murderer was apprehended but there were plenty of unanswered questions. Why did the police drive alongside the fleeing murderer for a long while, witnessed by bystanders and recorded on video. What did they say to each other for a prolonged period of time before the arrest was made? Kim Ley led the grass root advocacy group Khmer for Khmer that aligned several of the country’s grass root movements, and had also started a political party which was quickly gaining support. He often spoke out in criticism of the prime minister Hun Sen, and only briefly before the shooting, he had added comment to a report on widespread corruption. Although the 38 year old murderer claimed that a dispute over money led to the shots being fired, the opposition claim that it was a planned assassination, although the accomplices are as yet unknown. In order to understand the present situation, the past must be considered. The government party CPP (Cambodian Peoples Party) have been in power since the Vietnamese invasion of Cambodia in 1979 that removed Pol Pot and his Khmer Rouge. 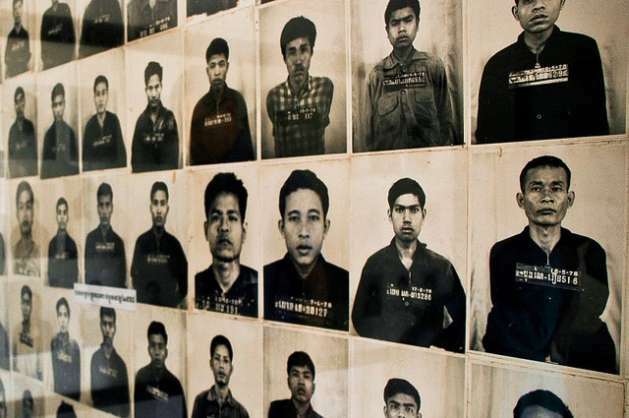 With messages from the leadership like: ”It’s better to kill an innocent by mistake than spare an enemy by mistake.’ the Khmer Rouge communist reign of terror decimated Cambodia by killing one fourth of the population. The effects of that systematic torture and murder of those deemed unsuited for the Khemer Rouge society, is still visible in today’s politics. From the tenth floor of Phnom Penh Tower, the Swedish embassy overlooks the heavily trafficated city streets that clog to a standstill several times every day. From there, Andreas Johnsson, among other tasks, can overlook the political situation in the country. Down below SUVs crowd the narrow streets as testiment to a booming economy. Growth is around 7-8% annually. For some, times are very good. But only few can reap the gains. Of the 16 million inhabitants of Cambodia, as many as 12 million are surviving on just over 2 dollars per day. The spread of mobile phones and increasing use of social media has spurred a willingness to discuss political issues. At the same time, the important textile industries have increased pressures as they demand improved wages and a higher standard of living. This forms a growing demand for change, which isn’t easy to deal with for a leader who has been in power for more than thirty years. The CPP realize that they must deal with the opposition in some way. The results of the last elections in 2013 shocked the party. Although they won, the support for the opposition had grown significantly. Soon after that result, leader Hun Sen realized that some action must be taken. He brought forth several reforms and reached out to the leader of the opposition Sam Rainsy. But the initiative quickly got bogged down without making any reforms and relationships quickly cooled. Rainsy was also accused of numerous crimes and charged with criminal defamation. As the upcoming elections on local and national levels grow near, new laws have been introduced that curtail the opposition. In February, a law was enacted that could lead to political parties being banned if they are repesented by criminals. While that might sound like a sensible idea, the reality of it, and that was apparent to the opposition, was that opposition representatives had started to be charged with crimes. Their claims that the charges were unfounded has been backed by Amnesty International. Sam Rainsy decided to leave Cambodia and lives in exile in France. One month ago he also resigned as leader of the opposition in order to stop any attempts to ban the party due to the new law. Persecution has also been seen on the streets as several representatives have been struck down by unknown assailants. Another legal challenge has come with a new law that regulates union activity. Regulation dictates which unions are given the right to negotiate and for independent labor unions this makes organized efforts more difficult and they risk losing members. Furthermore, the government has proposed a new law to regulate minimum wages. According to the proposal, mimunim wage levels are set for the entire labor market, and not for individual industries, for example the textile industry. These minimum levels are to be set by a tripartite committee representing unions, employers and the State. But when the levels are set, protests by the unions would be outlawed. The proposal goes even further, in banning research and reporting on minimum wages. These laws have made it difficult for opponents of the legislation to come together. There are 3000 registered labor unions in Cambodia, a country that is considered to be one of the most corrupt in the world. I follow forest protection issues in Cambodia, and people working to protect forests (which are crucial to the livelihoods of rural people) are being killed as well.